Do you ever have something that you notice, sort of make a mental note of, and then move on with life, not exactly forgetting, but not really understanding either? For example: I distinctly remember being in the Dominican Republic where I had been working for the summer with a mission organization called Students International. One of my friends, also working with SI, was from a village a few hours from where we were there in Jarabacoa and so one weekend we went for a visit, to stay with her family. Their house was spotless, despite the dirt floors and lack of what, growing up in suburbia, I would have considered essential modern conveniences. Like hot water, or even a shower that worked by turning on the knob, rather than filling a bucket overhead. The family’s hospitality was warm and inviting, and it was a fantastic weekend all the way around. But randomly, one thing stuck in my head—the washing of the dishes. The family’s house was really more like part of a compound of extended family, each house surrounding a sort of outdoor common area, where the ‘kitchen’ was. That was where the washing up of the dishes happened as well. What I noticed was, rather than fill up a large tub with soapy water and proceed to clean, the women in the family, for they were the ones washing the dishes, cleaned each dish individually, using a small amount of water and then rinsing it, using that water to wash the next dish. I noticed it because it was so different from the only way I had ever experienced hand-washing dishes—either at my paternal grandmother’s house in Mexico, or at my maternal grandparents’ summer cottage (does that sound pretentious? If you saw the ‘cottage’ which is beautiful, but built in 1900, it is a bit less so than you might imagine) in Upstate New York—which began with the filling up of, typically two big tubs, one with soapy water and one with rinse water. My cousins and I always tried to get to be the ‘rinser’ because that was clearly the easiest job, when compared with washing or drying. A few years after that trip to the Dominican Republic I had the opportunity to be in Malawi, in Africa, as a photographer with another group of short term missionaries who were visiting various sites working with AIDS orphans as well as micro-finance and development projects. On one of those days in Malawi we were at an ‘after school center’ which was more like a concrete slab with a roof over it—a definite improvement over the alternative of open air and dirt floor. 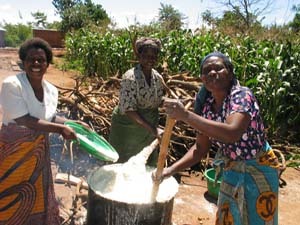 As we were singing and playing with the kids, I watched the women (yes, again women) who were cooking the lunch—nseema, a corn porridge type meal that is common in Malawi. I also noticed that, again, as they were cleaning up, there was no large tub, but each dish was washed individually, using the water to wash the next dish. It was not that I was pondering this issue of the dishes in my day to day life, but somehow both experiences stuck with me and sort of just sat there, somewhere lodged in my memory. Like a seed, dormant, waiting for the right set of conditions in which to germinate. It was not until a few years later, as I was spending more and more time in my grandmother’s house in Baja, and as that summer had been a particularly dry one, with frequent water outages, that it occurred to me what was going on. The thing is, growing up, my limited hand-washing dish washing experiences had been in places of plenty, of abundance. No one had to carry the water we used—we just turned on the tap. No one had to light a fire to heat it—we just turned on the tap. There was no wondering if there would be enough water to last until we could get more—we just turned on the tap. 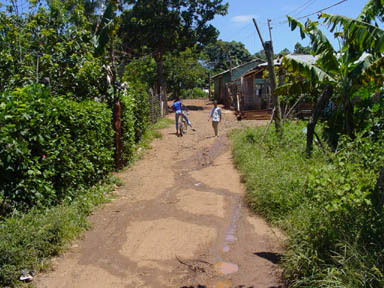 But, even more than that, the ability to turn on the tap is what kept me blind to the reality of my friends there in the Dominican Republic, and of those women in that village in Malawi. It’s not that running water is bad. Or that washing dishes in the two tub manner is inherently evil. What I find troubling is the way that my own privilege could have kept me from seeing—and not only that, it actually determined what I was able to see. The lens through which I viewed the world led me to assume that this other way was not simply different, but was, in fact, inferior. Ouch. That, it seems to me, is the danger of such privilege. The underlying assumption that someone else is not just different, but is wrong, without a deeper understanding of why that difference exists. Were it not for my own experience of ‘drought’ it’s likely that I would have continued on in my blindness. We are, as it happens, approaching the season of Lent. Lent, the time between Ash Wednesday and Easter Sunday (often spoken of as 40 days in duration), is a season of preparation—a preparation that is typically seen as involving some form of self-denial. This can take the form of giving up chocolate, or sugar, or alcohol or some other chosen ‘vice’ or ‘indulgence’ as a way of dedicating oneself to God. Many are critical of the practice—seen as an excuse to go on a diet, or a denial of that which is pleasurable simply for denial’s sake. But I wonder, and I’m pondering, as I consider Lent this year, if there might not be another way to approach this season. Might Lent, instead of simply being a time to ‘give up’ something, be a time to enter into something more deeply? Might there be a way to allow Lent to help open our eyes, to shed light on the blindness that a life of privilege can bring? Might Lent offer an opportunity to pause, to reflect, and to stop filling those tubs of water all the way full…? After traveling for about 36 hours (and stopping in London and Johannesburg) we arrived in Malawi Monday afternoon. Needless to say, Monday was mostly a rest day! Ministry of Hope is an organization that is working in the communities/villages around Lilongwe (the capital, where we are staying) with the children and specifically orphans. On Tuesday we helped out in their crisis nursery, which is for babies who have been orphaned mostly because the mother has died during childbirth or of AIDS and the father is either also dead or cannot care for the infant. Some of the babies in the nursery do have families that will take the children back once they have been weaned, but many are without any family. On Wednesday (today–we are 9 hours ahead of California) we spent the day working at one of the Ministry of Hope centers in the town of Mponela, about an hour’s drive (on good roads). Along the way we drove through many communities and saw a surprising number of coffin makers…apparently there is quite a market for coffins here. One of them was called “Energy Coffins”–seems like an interesting name. We also drove past the Blessings Bottlestore and the Slow But Sure Grocery. Once we arrived at the center we began playing with the children. Let’s just say, the digital cameras and the video camera were a big hit! The children (and adults, for that matter) love to see their picture and request it after every picture is taken (good thing I have an extra battery!). Other impressions…the vegetation is quite lush. I was surprised. I guess I thought (incorrectly) that all of Africa was dry and dusty. The people are friendly. I made friends with the women cooks for the center (they make lunch each day for the children—it may be the only meal they receive each day) who taught me how to make ‘seema’ which is sort of like Cream of Wheat but made with a corn meal flour. They also call it porridge, which I guess is a residual from the British colonial influence. The ladies laughed at how I stirred the seema (it was in a huge pot on an open fire, and stirred with something that resembled a large wooden oar) and taught me how to say “I am stirring seema” (sorry, I can’t remember that one…). We left the St. Andrews church parking lot at 4:30PM on Saturday for the drive up to LAX to begin the journey…we arrived to our hotel (The Capitol, quite nice and even set-up with a fitness center so I can at least attempt to continue my marathon training on the treadmill…) at about 2PM on Monday…it was quite a journey, and I am feeling rather jet lagged, but am trying to put off sleep until it is at least a somewhat reasonable bed time. The air feels very tropical here. It reminds me of the DR or of Hawaii–even those same orange blossomed trees (I don’t know my flora) that are so beautiful in Hawaii. It is pouring rain outside…and even though I own multiple rain coats in Southern California I did not make room for said rain coats in my luggage, so we will see how it goes. The area that we drove through to get from the airport to the hotel (about 30 minutes) was green and quite lush. I am surprised at the tropical-ness of it. That’s all for now, hopefully there will be more interesting strories once we start our stuff tomorrow..oh yeah, and I want to test which way the water goes down the drain–isn’t it different in the Southern Hemisphere? Yes, these are the things that intrigue me!